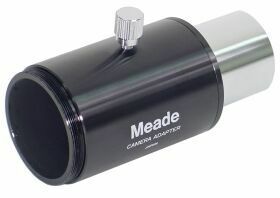 Meade Basic Camera Adaptor 1.25"
Want to take pictures of the night sky through your telescope? The Meade Basic Camera Adapter is the simplest way to get started. It attaches to your telescope by sliding into either the focuser or eyepiece holder, and then your DSLR camera attaches to the other end of the adapter via a T-Mount (sold separately) for your camera (Nikon, Canon, etc.). An eyepiece is inserted into the barrel of the adapter and locked down snuggly by turning the thumbscrew, and the magnified image of the object is projected onto the camera film plane. This is called "eyepiece projection" photography, The adaptor can also be used for prime focus imaging where your Telescope becomes the cameras lens.